Spend $50.00 and get Free Shipping across the U.S.
Continental U.S. delivery addresses only. Remote areas where ground service is not readily or reasonably available may not qualify. We reserve the right to review orders after they are placed to confirm eligibility of Free Ground Shipping. In the event that we cannot offer free ground service we will contact the customer before releasing the order. 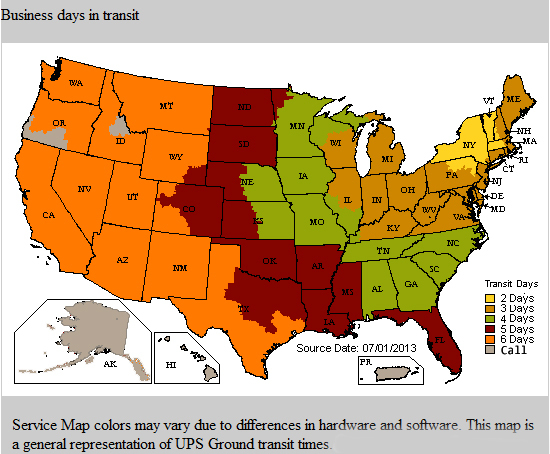 UPS Saver (next business day, for orders placed by 12pm eastern time). UPS Expedited (2 business days, for order placed by 12pm eastern time). Free shipping applies to all orders shipping within the continental U.S. and are not considered remote or special delivery locations. If your order does not meet our continental or domestic delivery standards we'll call you with alternative shipping options. Our primary carrier is UPS however some shipments may be turned over to DHL, FedEx the postal system or another reputable courier service. Great news to our Canadian customers. We have a shipping point from within Canada so there are no surprise charges (like brokerage and duty fees). For more information on Canadian orders visit our Canadian page. Most orders are shipped within 1 business day and ship out of the northeast. Transit times vary between 2 and 7 business days. Take a look at our transit map for more details, please note that transit times are provided as estimates in business days only and excludes any national holidays. Most US bound shipments will be delivered via UPS. Please do not use a PO Box address for shipping. Please wait 1 business day for the tracking number to work as some tracking numbers are generated before they enter the couriers system.